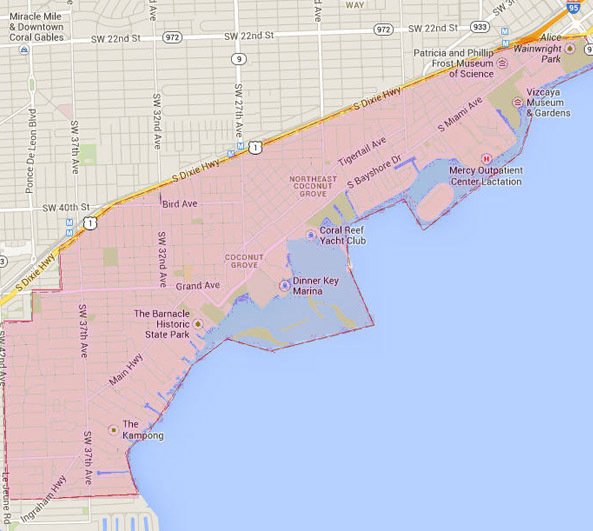 Coconut Grove is the oldest continuously inhabited neighborhood in Miami formed along Biscayne Bay and “the ridge” to prevent flooding. It pre-dates the City of Miami and was annexed into the City of Miami against its will in 1925 but stands apart from the City of Miami as a distinctive entity even today. Steeped in rich cultural heritage, Coconut Grove is also an extremely dynamic business community located between Biscayne Bay and Highway US 1. Coconut Grove is home to many popular annual events, galleries, outdoor dining, and much more culturally stimulating activities. Peacock Park, formerly known as Coconut Grove Bayfront Park, has views of sailboats and the bay enjoyed by residents and visitors. Peacock Inn was situated in Peacock Park between two large mature oak trees. The inn was built in 1882 as the Bay View Inn. The Peacock Inn was run by the Peacock family until the late 1890s and was sold to become Lake Placid School. The hurricane of 1926 leveled the park and only the two oak trees were left standing. Today, the Park offers family friendly activities. The Barnacle is a historic park built in 1891 and a place to visit in Coconut Grove. Guided tours are available, as well as events like a chili cook-off, concerts, movie screenings under the stars and other fun events for the members of the community and visitors. Coconut Grove Playhouse, built in 1926, is diagonally across the street from The Barnacle. After the 1926 hurricane damaged it, the playhouse finally opened in 1927 as a moving picture (silent movies) theatre. During WWII it served as a naval officer training area. In 1954, the playhouse was closed for two years and converted into a live theatre. Coconut Grove Playhouse is one of the most famous playhouses in the Southern United States. The Grove is also home to Vizcaya Museum & Gardens and Miami Science Museum which is set to move and open in 2015 in the new Patricia and Phillip Frost Museum of Science. The Coconut Grove arts festival created by the Coconut Grove Arts & Festival Historical Association, Inc. occurs during President’s Day weekend in February. Residents and visitors can enjoy a mile of food, arts and fun activities in the streets of Coconut Grove, just south of downtown Miami. Coco Walk is an upscale, open air shopping and dining destination. The area is diverse and unique with boutiques, casual dining, modern movie theatre, live music, and relaxed atmosphere. The Mayfair is a unique and elegant hotel by Coco Walk in the heart of Coconut Grove. The Grove is also known for its delicious eats. There are several different cuisines to choose from, many with outdoor seating and open air cafes. Local Grove favorites include Monty’s Raw Bar, Peacock Garden Café, Scotty’s Landing, Chart House, and Greenstreet Cafe. The Grove is a unique place with its residential areas mostly comprised of luxury homes located among narrow streets surrounded by lush tropical landscaping plus a large number of townhouse style residences. Coconut Grove is a charming, bohemian and eclectic village within the heart of Miami. If you have any interest living in Coconut Grove, contact us and we will assist you with your real estate needs.